Friends for Good Health International Chairman Bobby Bobby K. Kalotee was interviewed by Simmy Harding. They where talking about me and Friends for Good Health. 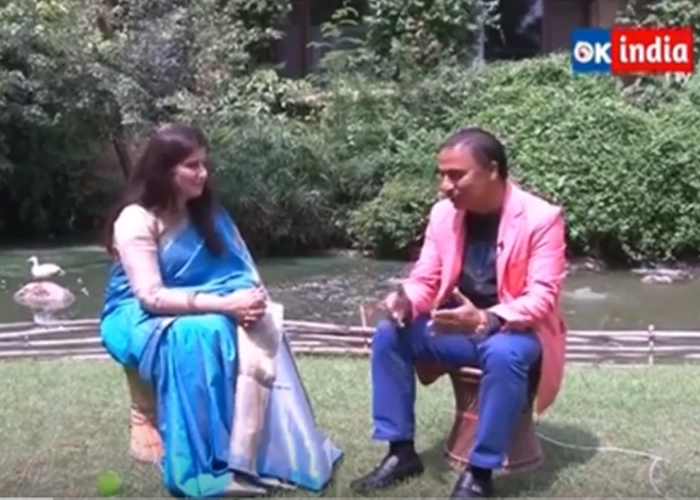 The interview was in both Hindi and English. I am honored and humbled to march in the New York City Veterans Day Parade. The freedom we enjoyed since America’s inception was celebrated today to honor the sacrifices the members of our armed forces so our children and grand children can continue to enjoy living free. We thank our Veterans for our everyday freedom, I am glad our new President-elect Donald Trump strongly believes in support and respect for our Veterans. So today marching with all our Veterans along with honorable New York City mayor and my friend Bill de Blasio to remember and celebrate our Veterans. Today I am so proud of President elect Donald Trump for keeping his campaign promises by visiting Carrier Air Conditioners Company in Indiana. By visiting the company and meeting those hard working employees showing them how serious Mr. Trump is to his commitment to keep and make America great.He just showed how his business skills enabled him to communicate with other business leaders to keep the jobs from leaving the U.S. As usual liberals like Bernie Sanders think“Trump has endangered the jobs of workers who were previously safe in the United States. Why? Because he has signaled to every corporation in America that they can threaten to offshore jobs in exchange for business-friendly tax benefits and incentives. Even corporations that weren’t thinking of offshoring jobs will most probably be re-evaluating their stance this morning. And who would pay for the high cost for tax cuts that go to the richest businessmen in America? The working class of America.”Mr. Sanders skills are how to criticize others achievement with no solutions. Mr. Sanders knows how to say how to play with peoples minds by offering everything and give nothing. Its just like you cant give anything from an empty box. Mr. Sanders never communicated with any business leaders and knows little about anything else other a senator. Even at that he is not a good senator. So lets stand with President elect Trump and Vice President elect Pence for the success of their leadership for a better America. As I agree with President Obama and Hilary Clinton election is over now we have a new team elected, we all stand with them and we want them to succeed as our tradition of democracy is. Lets all join together in the spirit of the holidays in the hope of the best for all America and Americans. God Bless the USA the greatest in the world. Peace for all. There should be no controversy when it comes to the flag of America. Every nation gets recognized by flying their flags to show their pride. The same way we do if not more when we landed on the moon we put our flag there. It was a beautiful afternoon in NYC to join with MMUN delegates, teachers and parents from all over the world for the 2017 Inspiring the Youth conference. I was honored to join with my friends and a leaders in humanitarian work Jack Brewer, Judith Cunningham and Michael Jacobson. I was thrilled to see that this year’s participation from all involved was the largest gathering in the history of MMUN. All the delegates, parents and teachers showed their enthusiasm to work together for a better and peaceful tomorrow. Dr. Dr. Bobby K. Kalotee National Chairman Friends for Good Health attended the 72nd Regular Session of the UN General Assembly in New York from Sept 25 to Sept 29. Bobby had the honor to meet and greet so many world leaders. Here he is seen with H.E. Mr. Gaston Alphonso Browne, Prime Minister Antigua and Barbuda.GASTON ALPHONSO BROWNE, Prime Minister and Minister for Finance and Corporate Governance of Antigua and Barbuda, recalled how on 6 September, his two‑island State was victim to the ferocity of Hurricane Irma. “The island of Barbuda was decimated; its entire population left homeless,” he said. Describing the sheer difference in size, he noted that Barbuda was 62 square miles while Hurricane Irma was 375 miles wide. “Barbuda did not stand the faintest chance,” he said. “For the first time in over 300 years, there is now no permanent resident on Barbuda.” The residents were moved to Antigua, whose population increased by 3 per cent overnight.The residents of Barbuda were now anxious to return to their homeland but the island remained unfit for human habitation, he said. There was no electricity, no potable water, and 95 per cent of the buildings had been damaged or destroyed. The preliminary estimates had placed the cost of rebuilding Barbuda at about $250 million, he said, adding: “It is simply a stretch beyond our reach.” Antigua and Barbuda urgently required assistance from the international community, he continued, adding: “We have not stretched the palm of our hand because we crave, we plead because we need.” He thanked the first responders, particularly from Venezuela, who “went above the call of duty”, as well as all donors.The present international financial architecture was leaving small States such as Antigua and Barbuda behind, he said. Two Category 5 hurricanes in 12 days hit the Caribbean. That could no longer be dismissed as “vagaries of the weather”. Climate change was man-made, and must be attributed to nations that consumed 80 per cent or more of the world’s energy and emitted dangerous levels of pollution. All 14 Caribbean nations together produced less than 0.1 per cent of global emissions. “The unfairness, injustice and inequality are painfully obvious,” he said, urging the international community to provide financing at concessionary rates without artificial impediments.Like many small island States, his developing country was categorized as “high-income” thus denying it access to grant funding, he said, adding that the per capital income criterion was skewed. He asked: “Where is the justice in large wealthy countries borrowing on their capital markets at 3 per cent, while so-called ‘high-income’ small island States are forced to borrow commercially at 12 per cent?” It was irrational to graduate a small island State that could not pay its debts to high-income status.He stressed the need to make trade more fair, recalling how Antigua and Barbuda won a trade dispute with the United States at the World Trade Organization (WTO). Yet the United States had failed to settle, and the loss of trade revenue to his country had risen to $200 million. Honouring its obligation to Antigua and Barbuda was not a one-sided deal, of which the United States got nothing in return. The United States had been the greater beneficiary of trade with Antigua and Barbuda for decades while his country continued to suffer over 13 years of trade losses.Bobby K. Kalotee National Chairman Friends for Good Health attended the 72nd Regular Session of the UN General Assembly in New York from Sept 25 to Sept 29. Bobby had the honor to meet and greet so many world leaders. Here he is seen with H.E. Mr. Gaston Alphonso Browne, Prime Minister Antigua and Barbuda.Please click here to see the speech by Mr. Gaston Alphonso Browne, and comment on what Mr. Gaston Alphonso Browne had to say.GASTON ALPHONSO BROWNE, Prime Minister and Minister for Finance and Corporate Governance of Antigua and Barbuda, recalled how on 6 September, his two‑island State was victim to the ferocity of Hurricane Irma. “The island of Barbuda was decimated; its entire population left homeless,” he said. Describing the sheer difference in size, he noted that Barbuda was 62 square miles while Hurricane Irma was 375 miles wide. “Barbuda did not stand the faintest chance,” he said. “For the first time in over 300 years, there is now no permanent resident on Barbuda.” The residents were moved to Antigua, whose population increased by 3 per cent overnight.The residents of Barbuda were now anxious to return to their homeland but the island remained unfit for human habitation, he said. There was no electricity, no potable water, and 95 per cent of the buildings had been damaged or destroyed. The preliminary estimates had placed the cost of rebuilding Barbuda at about $250 million, he said, adding: “It is simply a stretch beyond our reach.” Antigua and Barbuda urgently required assistance from the international community, he continued, adding: “We have not stretched the palm of our hand because we crave, we plead because we need.” He thanked the first responders, particularly from Venezuela, who “went above the call of duty”, as well as all donors.The present international financial architecture was leaving small States such as Antigua and Barbuda behind, he said. Two Category 5 hurricanes in 12 days hit the Caribbean. That could no longer be dismissed as “vagaries of the weather”. Climate change was man-made, and must be attributed to nations that consumed 80 per cent or more of the world’s energy and emitted dangerous levels of pollution. All 14 Caribbean nations together produced less than 0.1 per cent of global emissions. “The unfairness, injustice and inequality are painfully obvious,” he said, urging the international community to provide financing at concessionary rates without artificial impediments.Like many small island States, his developing country was categorized as “high-income” thus denying it access to grant funding, he said, adding that the per capital income criterion was skewed. He asked: “Where is the justice in large wealthy countries borrowing on their capital markets at 3 per cent, while so-called ‘high-income’ small island States are forced to borrow commercially at 12 per cent?” It was irrational to graduate a small island State that could not pay its debts to high-income status.He stressed the need to make trade more fair, recalling how Antigua and Barbuda won a trade dispute with the United States at the World Trade Organization (WTO). Yet the United States had failed to settle, and the loss of trade revenue to his country had risen to $200 million. Honouring its obligation to Antigua and Barbuda was not a one-sided deal, of which the United States got nothing in return. The United States had been the greater beneficiary of trade with Antigua and Barbuda for decades while his country continued to suffer over 13 years of trade losses. Dr. Bobby Kalotee said he agree with New York Governor statement Saint Patrick’s day is a “day of inclusion”. Several bagpipe bands led a parade made up of more than 100 marching bands after Democratic Gov. 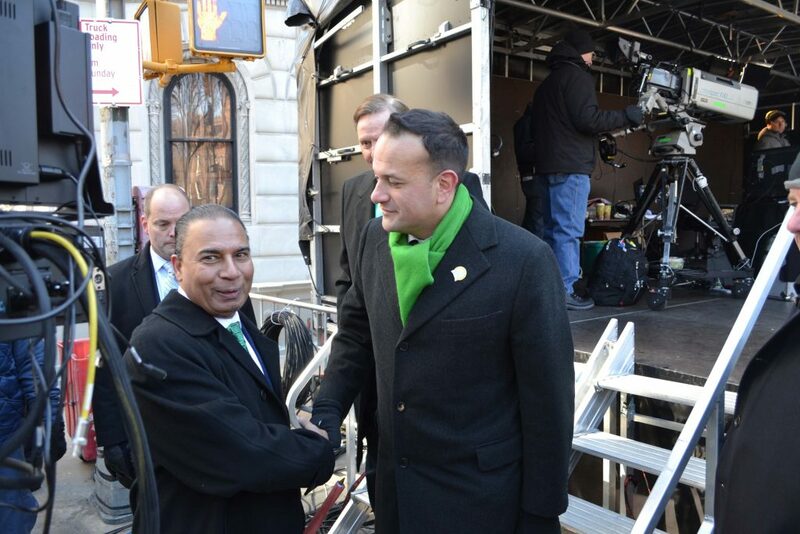 Andrew Cuomo spoke briefly, calling it a “day of inclusion” and adding: “We’re all immigrants.”New York City Mayor Bill de Blasio, also a Democrat, marched with police Commissioner James O’Neill under sunny skies.Varadkar, Ireland’s first openly gay leader, watched the parade at St. Patrick’s Cathedral before joining the march. In remarks, Cuomo said it was “my pleasure to march with him,” especially in a parade that long tried to ban gays.The parade, beginning at 11 a.m., lasted nearly six hours. An estimated 150,000 marchers made the 1.4-mile (2.2-kilometer) trek past Central Park, the Cathedral and Trump Tower.Large since the mid-1800s, the parade has celebrated Irish culture and Irish immigrants, who once faced nativist calls for their exclusion from the workforce — and from the country — when they began arriving in the city in huge numbers during the Irish Famine.In the 1990s, parade organizers were involved in annual court fights over whether to exclude openly gay groups from the march. This year, at least two groups in the parade had banners identifying marchers as gay, lesbian, bisexual or transgender.For the 167th time, the lead group marching in the parade was 800 members of the 1st Battalion, 69th Infantry Regiment, of the New York Army National Guard. Cuomo joined them. The regiment, once predominantly made up of Irish immigrants, first led the parade in 1851 as a deterrent to anti-immigrant violence.Judy Hughes, whose father used to march with the 69th Infantry Regiment, also known as the “Fighting Irish,” said she’s been attending the parade “since I was a little girl.”Her husband, Bill Hughes, a retired police officer who marched in the parade for 10 years, looked on as a band passed.“It’s better being on the other side,” he said.This year’s grand marshal was Loretta Brennan Glucksman, chairwoman of The American Ireland Fund, a group that has raised millions of dollars for philanthropic projects in Ireland, including funding for integrated schools for Catholic and Protestant children in Northern Ireland.She rode along the parade route in a Central Park horse carriage driven by a family friend.The parade was a familiar occasion for Matthew McCrosson, 68, who has frequently marched in it during the past half-century.“The parade truly signifies the Irish investment over 250 years in the greater New York area,” McCrosson said. “The parade represents not only Irish, but people from all nationalities.”Danny and Carol Manley, an Irish New Jersey couple, watched the parade with their son, Dan Jr.“We like to come back, get together, see the bagpipers and see how the generations have grown up,” Danny Manley said. Nassau County Human Rights Commissioner/Chairman Bobby Kalotee was honored to be marching with NYS comptroller Hon.Tom DiNapoli and other elected officials. Bobby was thrilled to see all the people along the parade route celebrating Saint Patrick’s day as he celebrates his birthday by joining so many on this great day and he said i was so happy o meet him eminence Cardinal Dolan. 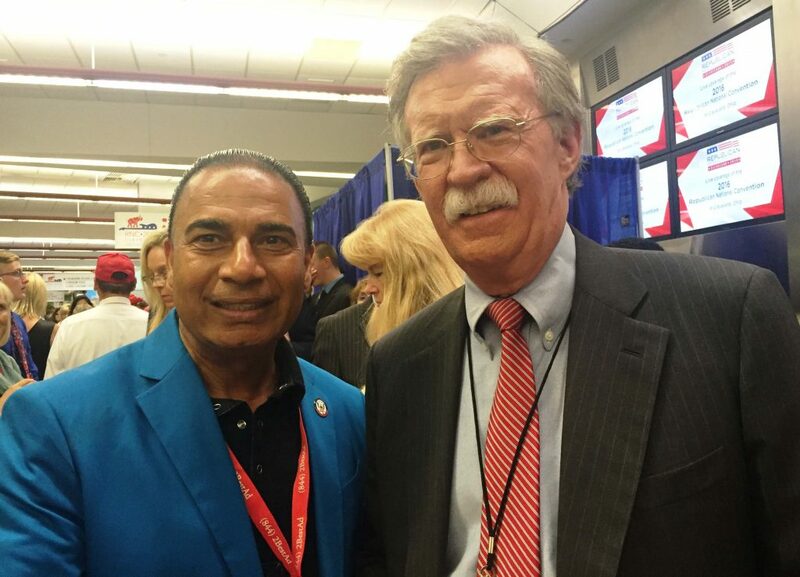 Dr. Bobby Kalotee chairman of Friends for Good Health and chairman of the Nassau County Human Rights Commission would like to thank president Trump for nominating my friend Hon. John Bolton to be the next National Security Advisor. 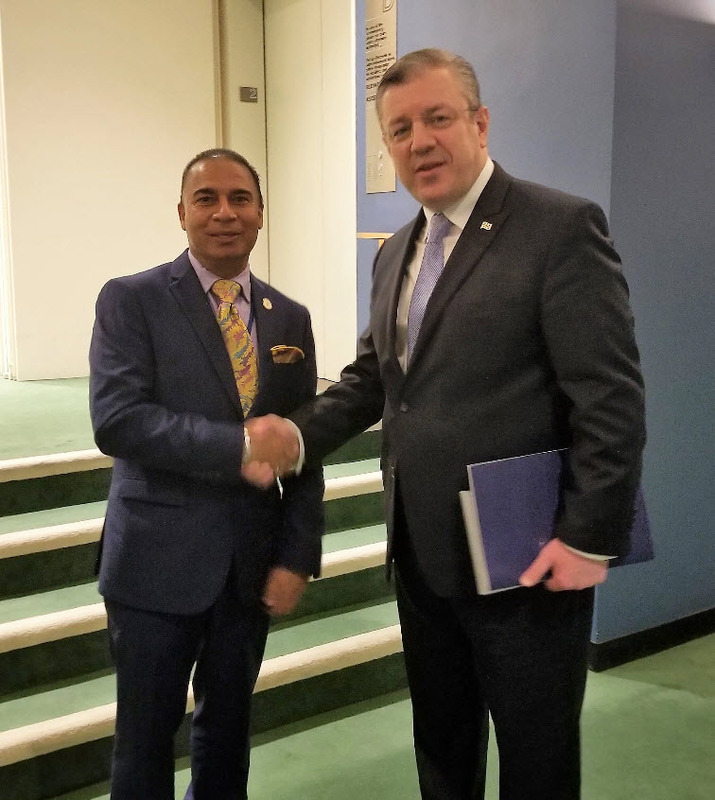 Dr. Bobby K. Kalotee Chairman Nassau County Human Rights Commission attended the 72nd Regular Session of the UN General Assembly in New York from Sept 25 to Sept 29. Bobby had the honor to meet and greet so many world leaders. Here he is seen with H.E. Mr.Please click here to see the speech by Mr. Giorgi Kvirikashvili, and comment on what Mr. Giorgi Kvirikashvili had to say. GIORGI KVIRIKASHVILI, Prime Minister of Georgia, expressed condolences and sympathy to the victims of hurricanes in the Caribbean and the United States and earthquakes in Mexico, saying no country, including his, was immune from natural hazards. Recalling that 2017 marked the twenty-fifth anniversary of Georgia’s membership in the United Nations, he said his country had, during that period, gone from being a recipient of United Nations humanitarian assistance to becoming a top reformer and Chair of the Open Government Partnership. It supported the Secretary‑General’s proposed reforms for the Organization, he said.He reviewed Georgia’s progress and commitment to democracy over the years, with its place in international rankings rising in such areas as fighting corruption, protection of property rights, an independent judiciary and law enforcement. “We are not making cosmetic changes,” he said, drawing attention to progressive initiatives contained in a new draft Constitution. Georgia aspired to become a full member of the European Union and the North Atlantic Treaty Organization (NATO), as it had long been an integral part of Europe’s broad cultural and historical tapestry.Member States knew fully well the Russian Federation still occupied Abkhazia and Tskhinvali/South Ossetia in violation of its many international obligations, including dozens of Security Council and General Assembly resolutions, he said. In 2017, the Russian Federation had intensified its policy of occupation and factual annexation. It had implemented so-called “integration treaties” and signed so-called “agreements” with de facto authorities, absorbing the two regions into its military, political, economic and social systems. The Russian Federation had also intensified the fortification of occupation lines, installing razor wire fences, trenches and motion detectors, he added.Georgia was committed to resolving the Russian Federation-Georgia conflict peacefully, with its Government complying with a European Union-mediated ceasefire agreement, he said. The Russian Federation, however, was not reciprocating. Georgia was grateful for United Nations support, including annual General Assembly resolutions on the right of return for internally displaced persons and refugees. However, he said, hundreds of thousands of compatriots still waited to return home because a Member State refused to comply with its international obligations. Georgia was determined to make the benefits of its European agenda available to people on the other side of the occupation line through a package of initiatives, including trade opportunities, health care, education and other social benefits, he said. 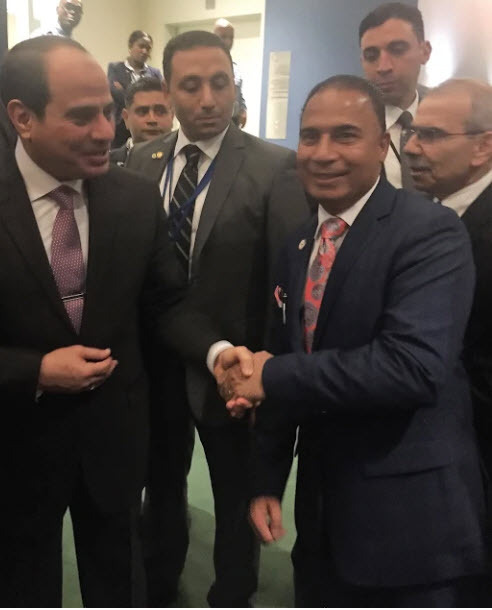 Dr Bobby K. Kalotee chairman of the Nassau County Human Rights Commissioner attended the 72nd Regular Session of the UN General Assembly in New York from Sept 25 to Sept 29. Bobby had the honor to meet and greet so many world leaders.